My Welsh Musings began on March 1st. St David’s Day, with some thoughts scribbled on a sheet of paper. Here are those words given digital life – a new thread in this blog, which will evolve into a page, maybe a new Blog. Tangled growth pierced by light. Light of the sky veiled by clouds. Clouds that drift, shifting the light upon the view. A view that is more than dreamt of. Some moments the mountains are hidden, sometimes a glimpse of an escarpment or a peak. Out there where the snow catches the light is the mountain that lends the region its name. At this moment the clouds even mask the snow, letting the light settle on lower-lying upland swells. Between distant mountains and the gentler land lies the estuary leading to the sea. Seagulls and crows soar towards us on the wind stirred currents. Spiralling over the trees, carving the air in graceful turns. Birds dart among the trees, seeking food and mates in the tangled undergrowth. Birdsong fills the air, from dawn chorus to nocturnal calls. Robin hops across rocks that mark the edge where a wooden fence will support climbing roses. Summer light will bring flower beds edging a patio creation. Days of sun that can already warm like our welcome to this wonderful new home. Neighbours offering willing arms, warm hearts and gifts to revive us after seven hours travelling. Cats wary of so many visitors, although curious about the woolly ones. But bravery has to come as doors are always opening at Pant Mawr. For this is Wales, the land of dragons and blessings. The songs and words are in the light, the trees, the warmth, and the smiles. Even the sheep come down from the hills to dash around, pausing to pluck at grass and ornamental shrubs. 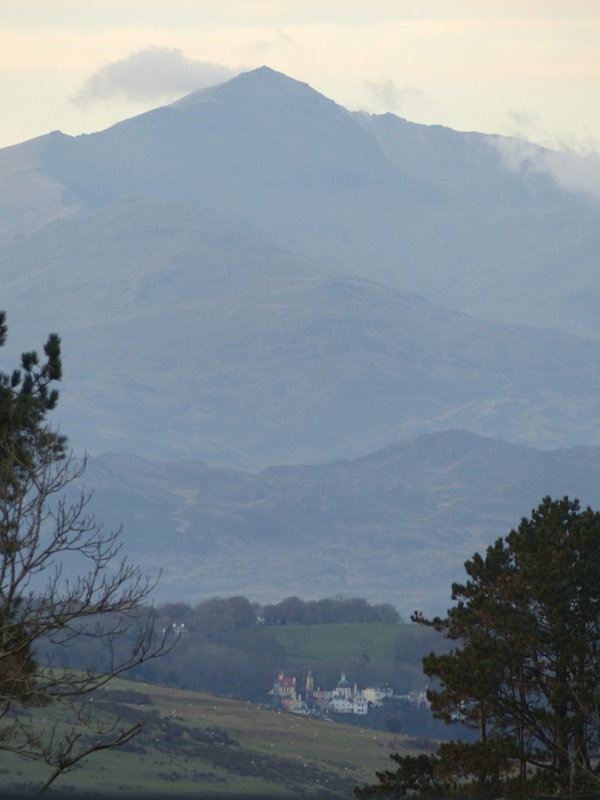 Welcome to Snowdonia and the mountain reaching for the light. This entry was posted in Life, Wales and tagged birdsong, clouds, light, sheep, Snowdon, welcome. Bookmark the permalink. Thanks Diane. Have to find the right sort of book to wax lyrical in… have one in mind. These lines made me agree with Diane above. Your love for the land drips through the lines. Thanks Damyanti. Having only just arrived in Wales it seems strange but call it love at first sight. Have a novel set on Dartmoor that can be re-located… in fact want to re-locate it as the setting is part of the tale.